Today Twitter has released Twemoji 12.0, bringing Emoji 12.0 support to its various platforms. The update comes hot on the heels of Unicode 12.0, meaning that Twitter are once again the first major vendor with support for the latest emoji additions. This means that users of the Twitter website will now be able to send an emoji of a 🦩 Flamingo, 🧇 Waffle, 🛕 Hindu Temple, or 🦦 Otter for the first time. 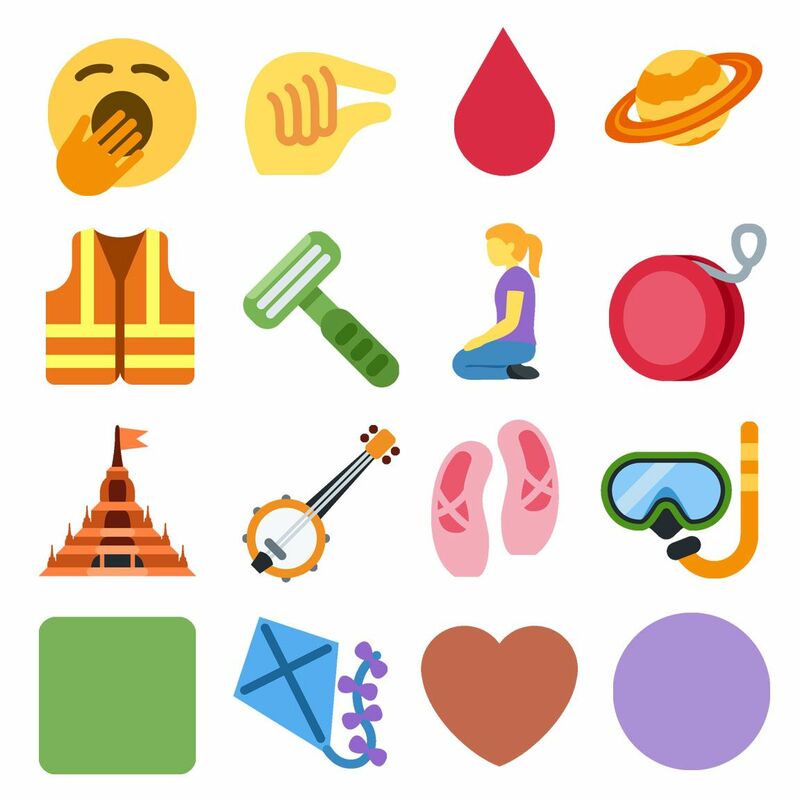 Additionally, a series of colored shapes are now available, as well as various accessibility-related emojis and people in wheelchairs, with canes, or prosthetic limbs. Above: A selection of the new Emoji 12.0 designs added to Twitter today. Twitter is frequently one of the first vendors to support new emoji updates for the past few years, although this year Microsoft have also been previewing early Emoji 12.0 support in Windows 10 for some users since November 2018. No previously released emoji designs have been changed in Twemoji 12.0. Twitter did however make a few changes in their last update just prior to this release. A total of 230 new emojis have been added in Twemoji 12.0. These consist of 61 new emoji codepoints and 169 new recommended ZWJ sequences. The majority of these recommended sequences are new options for people holding hands which now include support for skin tone modifiers for the first time.. 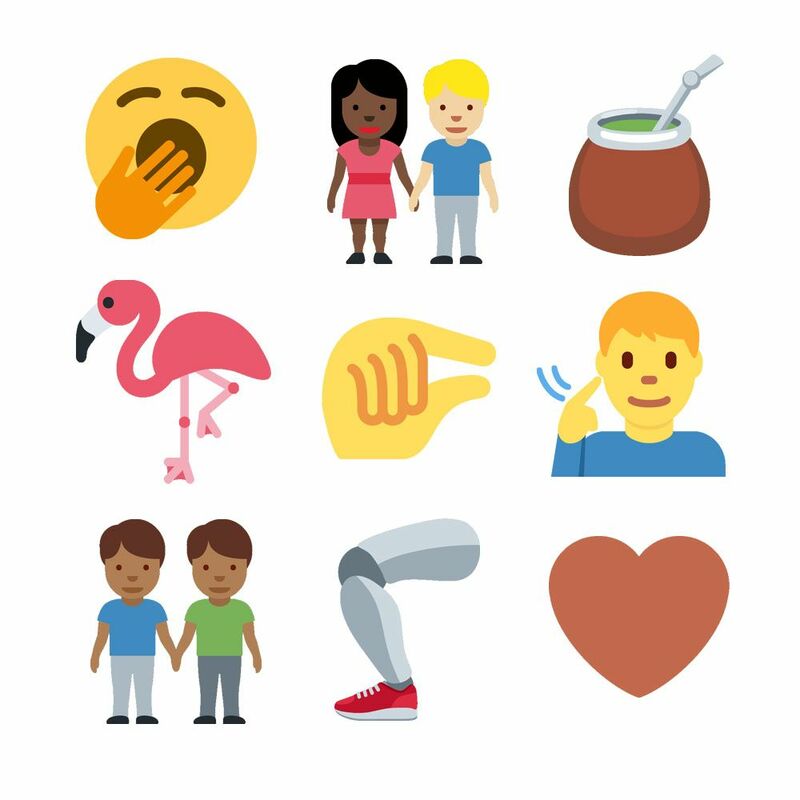 Above: A selection of the new people holding hands emojis as they appear in Twemoji 12.0. Now supported are any combination of women or men holding hands with a mix of skin tones. For instance, in a pairing of two women, these could now have a mix of dark or light skin tone, or both have the same tone. Unicode now recommends a new gender inclusive 🧑‍🤝‍🧑 People Holding Hands, but Twemoji 12.0 so far displays this emoji with the same design as 👫 Woman and Man Holding Hands. An unfortunate oversight or error. Inside the ZWJ Sequences for these new additions are a 👩 Woman, 👨 Man or 🧑 Person emoji, followed by the 🤝 Handshake emoji followed by another Woman, Person, or Man. System which don't support these new emojis yet (such as iOS) will continue to see the fallback mechanism, which shows the individual emojis that make up the sequence. For example, the following combination: 👩 Woman, 🏿 Emoji Modifier Fitzpatrick Type-6, 🤝 Handshake, 👨 Man and 🏻 Emoji Modifier Fitzpatrick Type-1-2 will be shown on many platforms until the 👩🏿‍🤝‍👨🏻 Woman and Man Holding Hands: Dark Skin Tone, Light Skin Tone emoji itself is supported. 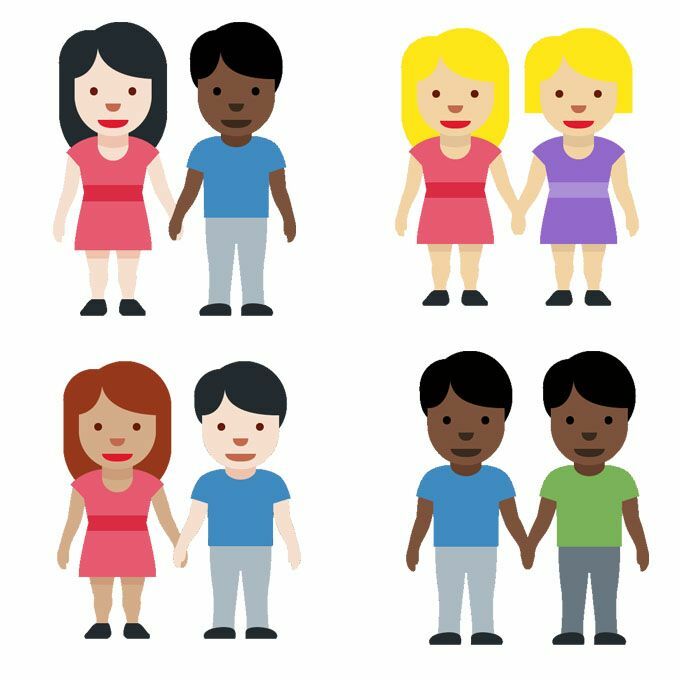 Above: a breakdown of the emoji which combine to create 👩🏿‍🤝‍👨🏻 Woman and Man Holding Hands: Dark Skin Tone, Light Skin Tone. A recently-released update to Twitter means that these interracial couple emojis will count as the same number of characters on Twitter as any other emoji (every emoji counts as two characters). In total there are 71 new hand-holding emoji combinations, all of which can be viewed via the full Emoji 12.0 list here. 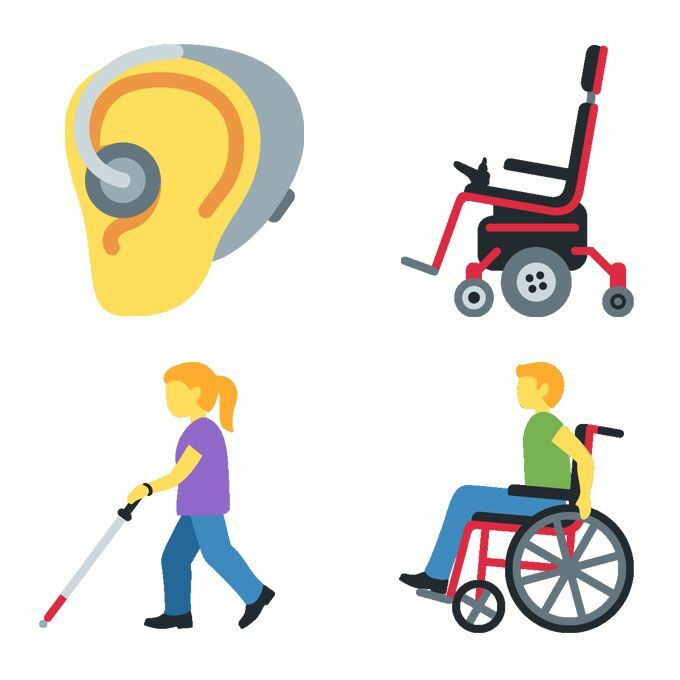 Another major theme within Emoji 12.0 is representation of differently-abled people and accessibility-oriented devices. Additions include an 🦻 Ear With Hearing Aid, a 🦼 Motorized Wheelchair, a 👩‍🦯 Woman With Probing Cane and a 👨‍🦽 Man in Manual Wheelchair. Above: A selection of accessibility emojis they appear within Twemoji 12.0. Additionally, there are two accessibility-focused animals: 🦮 Guide Dog and 🐕‍🦺 Service Dog. These two dogs join six other new animals, shown below. 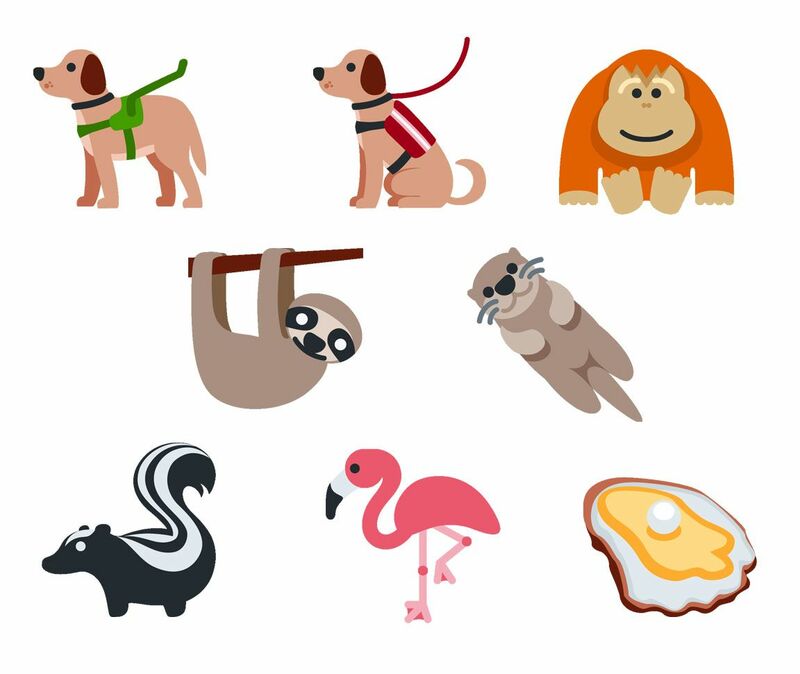 Above: the eight new animal emojis as shown in Twemoji 12.0. 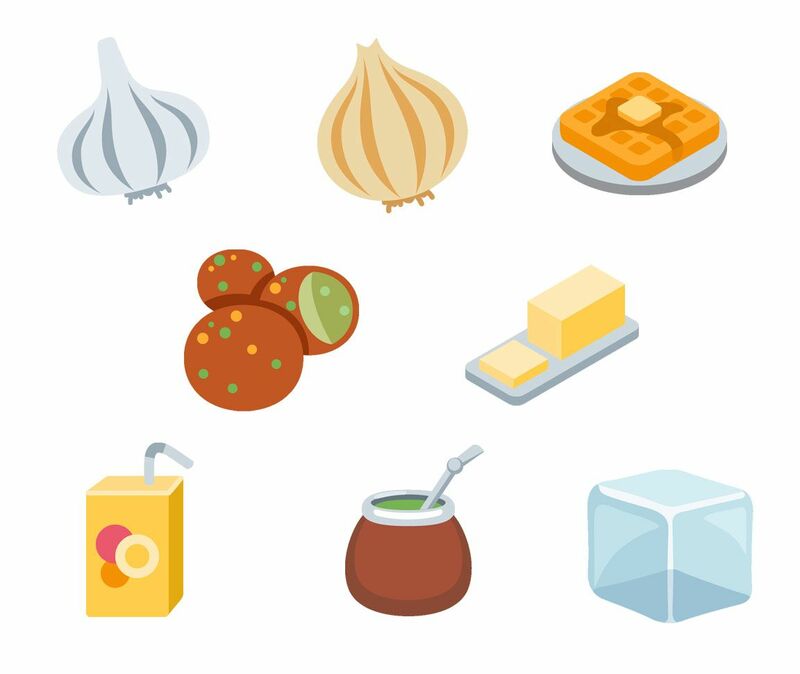 The update also features eight new types of foods and beverages, including the popular South American beverage 🧉 Maté. Above: New food options availailable now in Twemoji 12.0. The remaining 43 emoji addtions include a single smiliey (🥱 Yawning Face), a now-infamous new hand gesture (🤏 Pinching Hand), a long-requested analogue for menstruction (🩸 Drop of Blood), and many other clothes, objects, and symbols. A selection of these are shown below. The mix of new shapes means there are now a consistent nine colors available for each heart, circle, or square. A big upgrade for ASCII/emoji art lovers. No emoji designs have changed in Twemoji 12.0, but three were changed in the Twemoji 11.4 release just prior to this update. 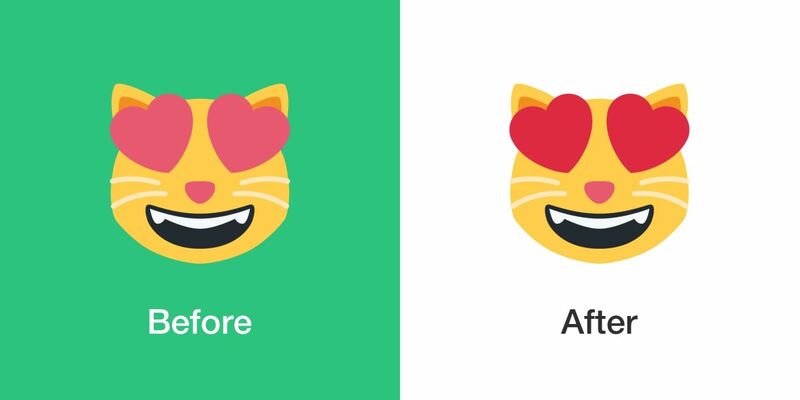 😻 Smiling Cat Face With Heart-Eyes now has red hearts instead of pink hearts for eyes. 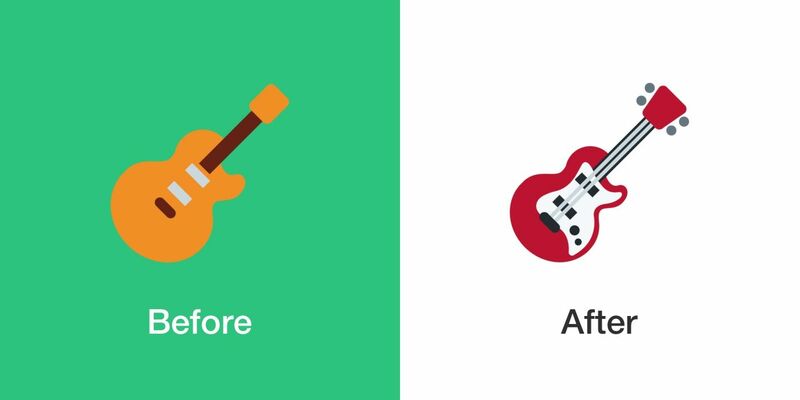 🎸 Guitar now displays as an electric guitar instead of an acoustic guitar. 🎻 Violin now comes with strings. Rollout of Twemoji 12.0 began today across Twitter's various platforms. In the coming days and weeks Twemoji 12.0 support will be made available for all users of the Twitter website, the Twitter mobile site, Tweetdeck, and progressively roll out to Twitter apps on Android. Notably, while the new emojis for 2019 are now supported, these don't yet appear in emoji-pickers provided by the Twitter web interface. This is not a major issue, given the lack of cross-platform support for Emoji 12.0 at this time, but does mean users that want to insert any new addition will need to do so via copy and paste at this time. As usual, users of the iOS Twitter app will continue to see Apple emoji designs, as Twitter for iOS defers to the system for native emoji support. iOS Twitter users will see support for the new additions when Apple releases an iOS update later this year. These updates will also be available within the Open Source Twemoji Repository in the near future.